Back to the Species at Risk Main Page. The committee on the Status of Endangered Wildlife in Canada is a committee of experts who determine the national status of native species thought to be at risk of disappearing from Canada. Members include academics, specialists, Aboriginal people or government, & biologists. This species is likely to become endangered if limiting factors are not reversed. The committee on the Status of Species at Risk in Ontario reviews the COSEWIC status reports for species that occur in Ontario, then makes recommendations on the appropriate provincial status of the species. 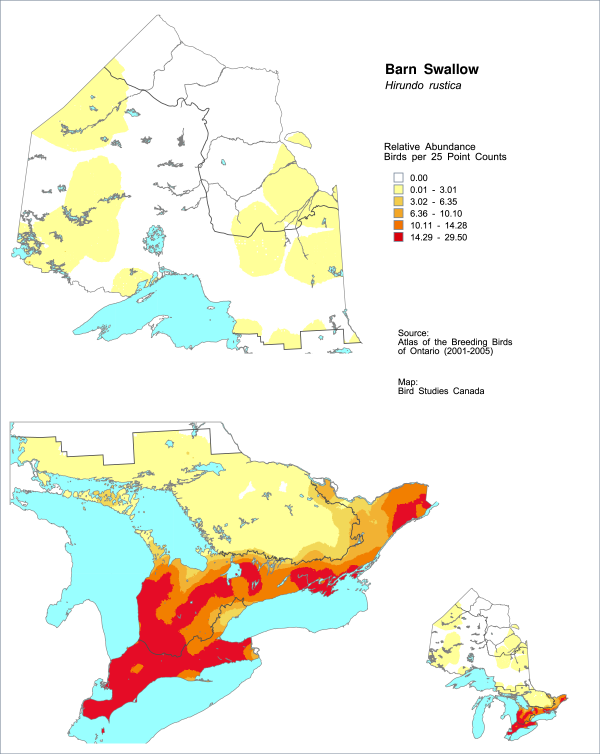 Provincial status is identified on the Ministry of the Environment, Conservation and Parks Species at Risk in Ontario (SARO) List. Have you seen this species at risk? Report your sighting. 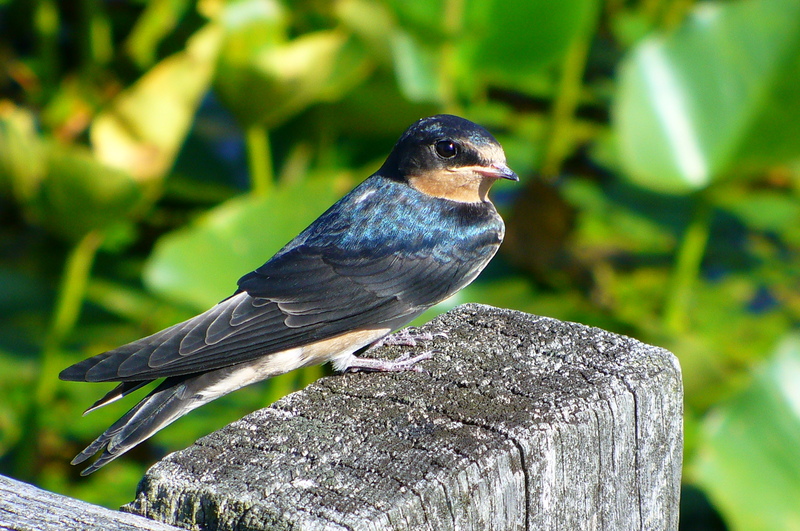 This attractive small and sleek-looking swallow has cobalt blue back, tail and wings. Males have buffy orange underparts while females are buffy white. Both have rusty coloured foreheads and throats. Easily recognized by their deeply forked tails. Tend to fly close to the ground or water surface and catch flying insects such as flies, beetles and wasps. They favour larger insects rather than swarms of small flies. Both male and female construct the cup-like nest from mud scooped from the water’s edge. The nest is lined with fine grasses and down feathers. Three to five eggs are laid from mid-May to August with the peak activity in June. The eggs hatch in roughly two weeks and the young fledge two weeks later. Early nesting pairs will likely raise a second brood. Older siblings and even non- related juvenile birds may help feed the hatchlings. Grasslands and other open areas, including urban parks, which have structures for nesting. Preferred sites include eaves, rafters, and cross beams of barns and sheds, as well as the undersides of bridges, wharfs, and large culverts. pesticide use in both the breeding and wintering grounds. acid precipitation which leads to depletion of calcium in aquatic insects. climate change altering the hatch out dates of insect populations and long-distance migrants like swallows arrive after peak insect emergence.